Whether you're a fly-fisher or a spin angler, a serious trout chaser or a novice who gets out once or twice a year, the Adirondacks is the place for you. Here, trout bums mix with beginners, and while it's usually pretty easy to tell them apart once they begin casting, this is a place where everyone feels at home on the water. Success is a relative term, but most anglers walk off the water with a smile on their face. It's the kind of place so scenic you'd probably wet a line even if you knew there weren't any fish swimming out there. 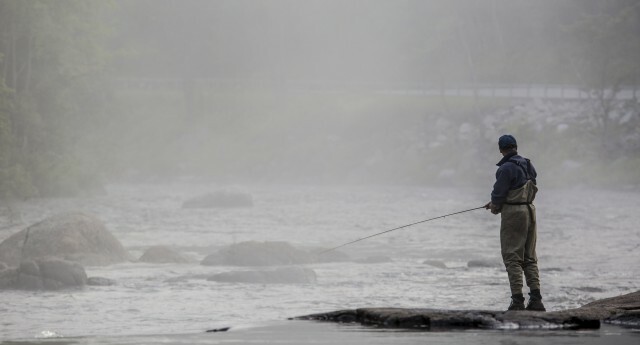 In the Adirondacks April 1 is opening day for fishing after a long cold winter. Many anglers, novices to expert, itch to get out in the woods and into the Ausable river to experience it's natural pleasure. April brings gradually warmer temperatures and a lot of water with the melting snow and ice. May is an excellent time for fishing in the Adirondacks, with fully open waters and plenty of fish. In June you will find the water is still quite cool and hatches are rich. July and August, the water temperatures rise and fishing will be at it's best early or late in the day. Once autumn in the Adirondacks arrives in September through late October, the river is less crowded and the foliage colors magical. The elusive brown trout is what brings many anglers to the West Branch of the Ausable River. The West Branch and the brown trout is an experience most fishermen have sought the majority of their lives. The arrival of spring in the town of Wilmington marks the beginning of another new year to get out and go trout fishing. While the West Branch Ausable River offers trout, there are several other species of fish nearby, like landlocked Salmon, lake trout, splake, bass, pike, walleye, perch, and sunfish. We are fortunate to be in the High Peaks of the Adirondacks where the lakes and rivers are so plentiful. The choice of where to fish can be your way to experience great angling while enjoying the beauty of the mountains. Areas like Taylor pond and Moose pond to this day are noted for large lake trout and yes, of course there is a chance at catching a monster lake trout in Taylor pond where many have said the next state record is bound to come from. There are also several small streams around that require a hike to reach them such as Franklin Falls Flow. Franklin Falls Flow is a section of the Saranac River called the Permanent Rapids located just over the backside of Whiteface Mountain. This is only a fifteen-minute ride from Wilmington. This area is appreciated by a few who consider it a little jewel in the Adirondacks. So in essence, the choice is yours where to begin your fishing vacation. You can be certain to find still or moving water most anywhere to locate a species of choice, from wading rivers or found taking a quiet stroll in a canoe on a peaceful lake or pond. It's the diversity of the river that allures many anglers to explore the West Branch of the Ausable. What stands out the most for the West Branch AuSable River is the large amount of pocket water. 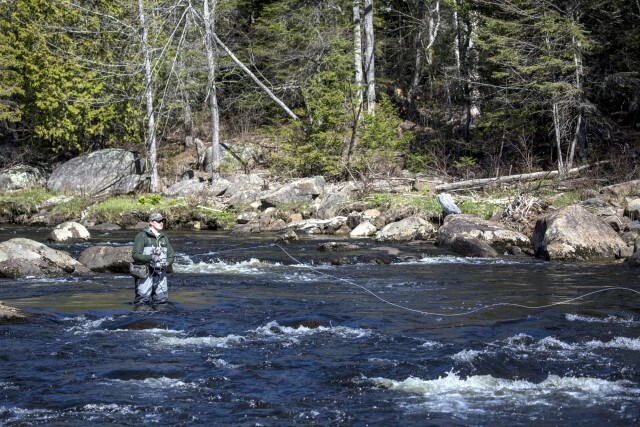 It's know to Adirondack fishermen, this is where the best trout live. The river holds vast amount of oxygen from water tumbling over the rocks and boulders which provide plenty of hiding places, food, and resting spots. The oxygen and shade from the tree cover help the survival of the fish during the warmer months. The river also harbors slower sections that are deep with undercut banks just waiting for your fly to drop in. One could also consider the East Branch of the Ausable River, above and below the town of Ausable forks, where you can find thicker pocket water sections that hold trout. This same river in the town of Keene offers a bit more opportunity as well. Far too often anglers miss these areas as the East Branch stands in the shadows the West Branch. If you are traveling here for a true fishing trip in the Adirondacks of NY we suggest speaking with a local guide to ensure you get to all of the best locations. The Whiteface Region of the Adirondacks has plenty of lodging properties and dining options catering to anglers. Be sure to visit the numerous area establishments currently offering fishing packages for your next getaway. Chances are the property owners do a little fishing themselves and will be glad to offer up some local knowledge to point you in the right direction. There are plenty of fly shops in the area if you seek further advice and some equipment too. They will tell you which patterns are working best and at what time, and will also hook you up with one of our veteran fishing guides who know the waters intimately and can help work out any kinks in your casting form. 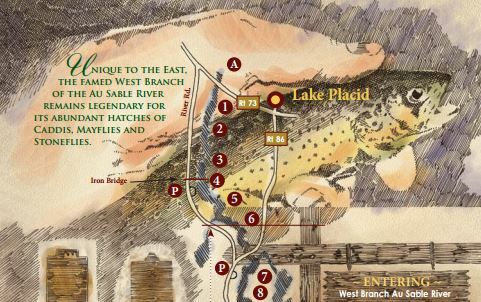 Our map of the Ausable River points out many of the fishing hot spots, giving you great ideas about where to start your fishing trip in the Adirondacks! Click below to download the map.